Because of high cholesterol content, eggs have been associated with high blood cholesterol diseases, such as heart attacks. For this same reason, many gym, fitness workout and body building trainers would only eat the whites and avoid the yellow "chicken" itself. That is until 2000, when the American Heart Association (AHA) announced that it is 'ok' to have an egg everyday for adults. Scientists found that while the egg yolk is high in cholesterol, it is not the direct cause for heart diseases. It is the saturated fat and trans fat commonly present in commercially processed food, such as fries, chocolate, etc. that affect our blood cholesterol the most. 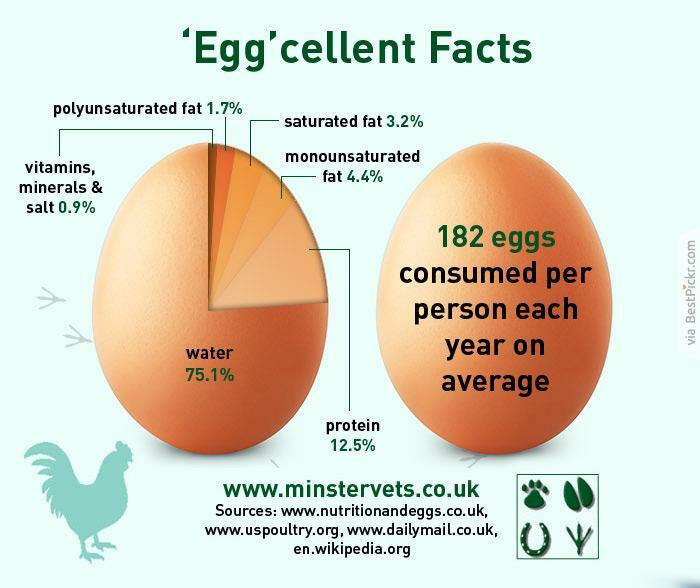 Eggs yolks have very high quality (gold standard) healthy nutrition facts to fat content ratio. 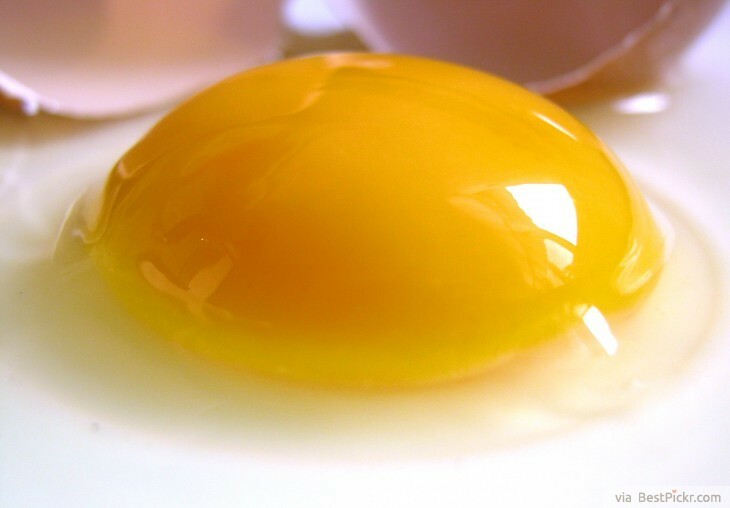 80%+ of good nutrients, such as protein, vitamins, carotenoids, minerals, fatty acids like the Omega-3, and many other disease fighting nutrients that help your body naturally fight aging problems, while increasing your brain's memory capacity, are contained within the egg yolk, not the whites! Wonder what kind of egg should you choose in plethora of choices at the supermarket? 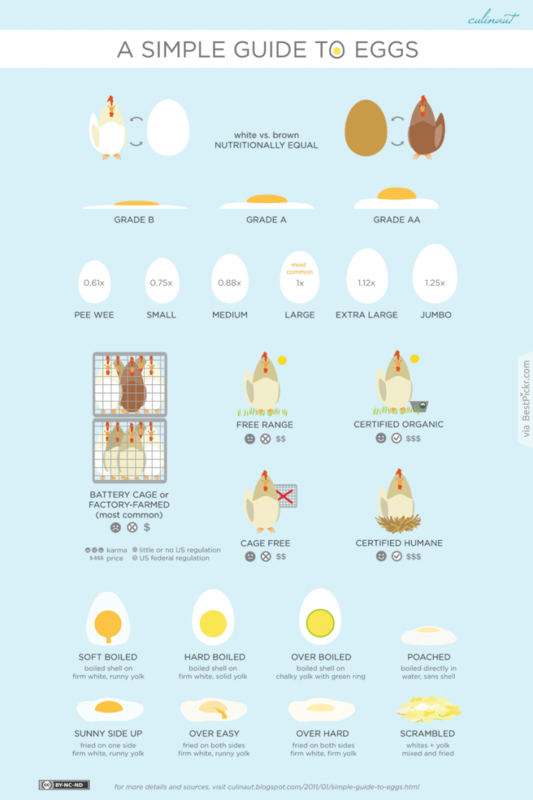 This egg infographic shows us that White vs. Brown eggs are nutritionally equal, and that the best type of eggs to buy are grade AA The Free Range Certified Organic or Certified Humane from local farmers with sustainable farming practices. Here is a list of organic US egg farms ranked by scorecard to help you identify them. The guide has chart of pee wee, small, medium, large, extra large and jumbo egg sizes. And basic cooking illustration for soft boiled, hard, over boiled, poached, sunny side up, over easy, over hard and scrambled eggs.